File Extension Dat. File We rarely find .dat file in a computer, but the actual program running on a computer itself. There are many files .Dat. The file is usually in the hidden mode, because any changes on the file make the program can not run or damaged. For that some software manufacturers put the file in the hide position. Damage that occurred in this file can be deliberately or accidentally can make a fatal error on software. If you want to view this file you can check "show hidden files" and uncheck "hide extension for known file type" in the folder option. This file contains data related to the software in the form of binary or text. This file can be read or open in the notepad, WordPad and Microsoft office. Many programs that are running and collecting data File Extension Dat, Microsoft Visual Studio, Corel WordPerfect, Nero Showtime, ect. That means that this program is very important in the software, so that the operating system read this file as main system. Nowadays we see a lot of files .dat in the VCD Video which is the source of the data to be translated in the player software to image and sound, so we can watch that video or movie. This file can not be run directly on the specific software, its mean that file must be converdted to the file extension that can play. 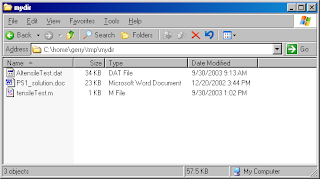 However, there are negative side of this file, this happens when the virus or malware use .dat file to attack computer systems. Operating system will find out this File .dat as a file system so that some anti-virus can not do regular elimination. Files were detected as the system will go into quarantine because if the changes can do fatal damage. In some way to overcome this, among others, by using safe mode when scan the computer with antivirus program, so that will not be seriusly damaged. If the virus can't removed from the system, better you ask the people who know about computer better for repair your computer. Don't ever try to repair your computer by your self, that can make a fatal error that can make damaged on your operation system or your other file.